Ideal for a wide range of individual muscle groups using both the push (compression) and pull (tension) modes. The push mode, subjective observations of the manual muscle test (Kendall technique) are replaced by objective repeatable measurements. All positive features of the manual muscle test are retained: all muscle groups may be tested; positioning of the subject is easy: and the clinician (not the dynamometer) determines the body position and the point (and direction) of force application. Three force applicators are included: a large padded circular applicator; a padded straight applicator; and a 1cm² non-padded circular applicator. Certain muscle groups like the back, leg and chest are measured using the pull mode. A swivel hook attachment is included to facilitate these and other pulling and lifting tests. Lifting and pulling tests can be administered using the pull mode with the swivel hook attachment. Hook may be used directly or a chain may be attached to the hook to facilitate a given test protocol. Pushing tests can be administered using one of the three push attachments. The Baseline® push-pull dynamometer features the hydraulic system that is used in both the industry accepted Baseline and Jamar® hand dynamometers and pinch gauges. Not only does this system give results that are more accurate than the spring push-pull dynamometers that are in common use today, it also allows the dynamometer to be much lighter and easier to use (1 1/2 lb. vs. 6 lb.). 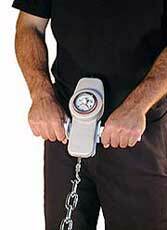 The dynamometer is easy to grasp while administering tests involving small forces. An optional dual grip or single grip handle is available for use when measuring large forces. Accuracy for the Baseline (Analog or LCD) hydraulic push-pull dynamometers is: ±1% at 25-75% scale, ±2% at 0-25% and 75-100% scale. The Baseline push-pull dynamometer is available with either a dial or a digital LCD system. Choose the 50 lb., 100 lb., 250 lb., or 500 lb. force capacity unit. Comes with 3 push pads (padded curved, padded straight, and a 1 cm² circular), 1 pull hook, and a carrying case. It has a 1-year warranty and is CE certified. The handle system screws onto the push-pull dynamometer body. Allows for a variety of tests. 12-0392 - 50 lb./22.5 kg. 12-0393 - 100 lb./45 kg. 12-0394 - 250 lb./115 kg. 12-0388 - 500 lb./225 kg. 12-0397 - 50 lb./22.5 kg. 12-0398 - 100 lb./45 kg. 12-0399 - 250 lb./115 kg. 12-0387 - 500 lb./225 kg. See our Baseline Push-Pull Dynamometer/Gauge Accessories Page for complete information about available accessories.